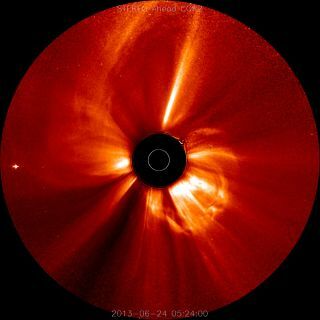 The STEREO (Ahead) spacecraft observed two large coronal mass ejections (CMEs) erupt into space in less than a day (June 23-24, 2013). The U.S. government shutdown has broken the links to many federal websites, but a vital source of information about sun storms and their potential effects on Earth remains available. The website of the Space Weather Prediction Center, an arm of the National Oceanic and Atmospheric Administration (NOAA), will continue to be maintained despite the shutdown, which began at midnight Tuesday (Oct. 1) when the Senate and House failed to agree on an emergency spending bill. The space weather center is currently tracking the solar fallout from a sun storm eruption earlier this week that is now arriving at Earth. SWPC researchers monitor solar activity and predict the potential impact of storms such as coronal mass ejections (CMEs), which blast huge clouds of charged particles into space at incredible speeds. CMEs that hit Earth squarely inject large amounts of energy into the planet's magnetic field, spawning potentially devastating geomagnetic storms that can disrupt GPS signals, radio communications and power grids for days. The SWPC's work helps the operators of spacecraft, power grids and other potentially affected infrastructure prepare for and protect against such impacts. In addition to the SWPC site, NOAA is continuing to maintain the National Hurricane Center web portal and several other sites that are considered vital to protecting human life and property. The shutdown has halted a great deal of federal science work. For example, NASA has had to furlough 97 percent of its 18,000-odd employees and cease most of its operations. The space agency is continuing to protect the health and safety of the six astronauts aboard the International Space Station at the moment, and it's maintaining currently operating scientific spacecraft. But work on most future missions has been frozen. For instance, preparations for the planned Nov. 18 launch of NASA's $650 million Maven mission, which was designed to help scientists understand how Mars' thin atmosphere has changed over time, have halted for the time being. A slip of a few days would not be a disaster, since Maven has until Dec. 7 to get off the ground. If the mission misses this launch window, however, it would have to wait until early 2016 for the next favorable alignment of Earth and the Red Planet.